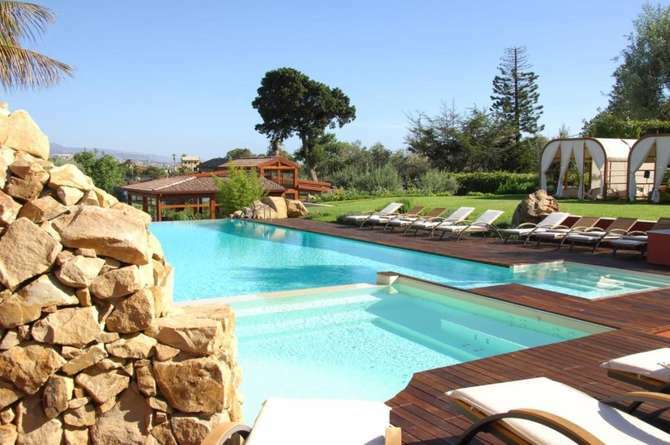 Surrounded by the greenery of a beautiful garden, Hotel Villa Morgana is set in the natural setting of the Messina Straits and the Ganzirri Lakes, overlooking the impressive pool and panoramic rooms. The Villa Morgana hotel was born from the careful renovation of a 70s villa, which preserves the elegance and warmth of the rooms and the characteristic "home atmosphere" that distinguishes it. The KiKlub Natural Wellness Wellness Center offers a range of exclusive treatments to give you moments of true relaxation. Hotel Villa Morgana has 15 rooms equipped with every comfort, furnished in a sober and elegant style and all different from each other. Our Standard Rooms are on the ground floor of the Villa with lake and garden views while our Executive Rooms are on the first floor, many have private terraces and some have lake views. Villa Morgana is set in the enchanting setting of the Ganzirri Lakes. It is about 7 km from the ferry terminals from Villa San Giovanni, Messina-Palermo (A 20) and Messina-Catania (A 19) and only 2 km from the important university and hospital district of Papardo.